NASA’s Juno spacecraft performed a close gravity assist flyby of the Earth on Wednesday, aiding its five-year journey to Jupiter. Earth’s gravity accelerating assist for the solar-powered spacecraft will result in increasing its velocity by 16,330 miles per hour, en route to studying Jupiter’s atmosphere as a means of better understanding how the planet, and by extension, the solar system originated and evolved. Riding atop the second most powerful configuration for the Atlas V rocket, the Juno mission lifted off at 12:25 EDT on 5 August 2011 – after a 51 minute delay for a technical issue and a boat in the launch restriction zone. The spacecraft made its first of three Mars orbit crossings on December 13 in anticipation for its August 2016 arrival at Jupiter after a five year trek through the inner and outer solar system. However, before it reaches its destination, Juno had to greet the Earth one last time, performing a flyby, passing within 347 miles of Earth. The flyby functions as a gravity assist for Juno, with Earth’s gravity accelerating the solar-powered spacecraft’s velocity by 16,330 miles per hour. 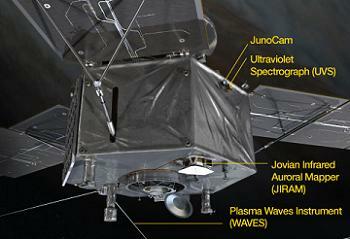 The purpose of using a gravity assist to get Juno on its way to Jupiter is one of cost. While NASA’s Jet Propulsion Laboratory has the role of providing the critical navigation for the mission and the flyby, Lockheed Martin’s Juno team is also playing an active and varied role. In preparation, most of the commanding was folded into a 28-day background sequence, and most of the sequences began on September 27. 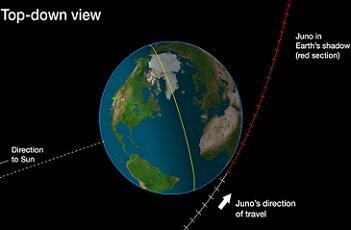 One major challenge related to ensuring Juno found a clear path, given its trajectory involved passing well inside the orbit of Geostationary (GEO) satellites. Catching a velocity boost isn’t the only value in the effort. 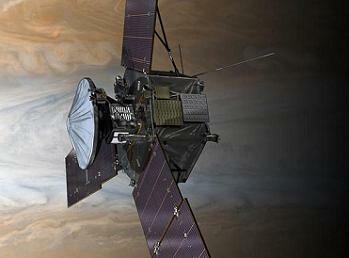 The operation also will permit officials to test Juno’s instruments and observe the spacecraft’s flight handling. “We’ll exercise the science instruments, since Juno’s instruments will be operating in a magnetospheric environment for the first time,” added Lewis. “The Earth’s magnetic field will allow a number of the instruments to be tested. We’re also using the flyby of the moon as an opportunity to gauge how the spacecraft operates. The connection between Juno to its predecessor Galileo is somewhat ironic to space fans. The Juno mission was in fact the first NASA mission to be launched after the fly out of the Space Shuttle Program. The final flight of the shuttle program flown by orbiter Atlantis landed just 15 days before Juno’s launch. The previous Jovian orbiter mission of Galileo was launched by the very same Space Shuttle – Atlantis – in 1989.